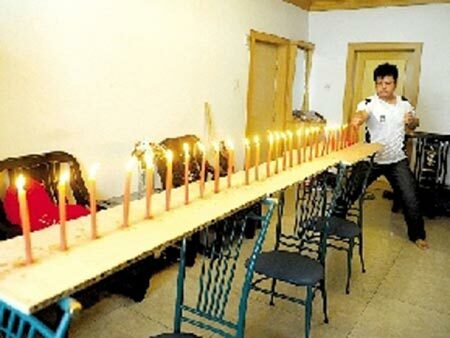 Can you blow out the candles being 3 meters away? Seems difficult? Well, it is not much of a hurdle for 23 year old Zhang Feng, from Zhengzhou in China. Zhang names this astonishing act as “Shaolin Sunshine Hand” which is an interesting King Fu technique that empowers his fist to produce energy, allowing him to put out candles being 3 meters away from them. This certainly reminds me of old Chinese kung Fu movies that were famous for their shocking action-packed scenes when specialized kung fu masters used to throw their enemies away by their power-packed punches and kung fu moves. This nerd looking dude has been practicing this art for last 8 years and has finally ended up achieving what he wanted to. In one of his interviews, he says that initially he was able to put out only 3 candles with his fist. But with the passage of time, he polished up himself for blowing candles up to 3 meters away which is worth praising. Zhang had experienced various challenges while accomplishing such task but he worked his fingers to the bone. Besides having his joints twisted for many times, he never gave up and kept on trying this act as soon he gets out of the sprain. “It’s not all in the fist”, says Zhang during the interview. He used to study a lot regarding the special techniques that are needed to fulfill this act. He used to make the most of Google translate for reading the needed stuff on internet. When there’s a will, there’s a way and Zhang has undeniably proved it by means of Shaolin Sunshine hand.